Child labour and access to education is a serious concern in a number of the countries in which DCI works. DCI believes that any initiatives to end child labour must address its root causes, such as poverty, and must emphasise the right to education. 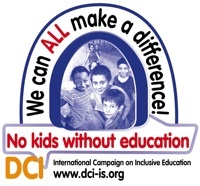 In 2007, DCI launched a Campaign for Inclusive Education to address the issue entitled “No Kids Without Education: We Can all Make a Difference”. The goal of the Campaign for Inclusive Education is to guarantee that 100% of school-aged working children and adolescents effectively exercise their right to a complete and quality education. In January 2001, DCI’s International Secretariat created a Child Labour Desk, with the aim of reinforcing DCI's action on the prevention and elimination of child labour, especially in its most hazardous forms, and strengthening DCI’s efforts to protect all working children. Promote the participation of children in awareness-raising on issues concerning children’s rights and child labour. Participating national sections, including DCI-Cameroon, DCI-Togo, DCI-Paraguay and DCI-Ecuador met with teachers in schools to set guidelines and evaluation criteria for child-rights friendly and inclusive school environments for working children.